BankUnited was honored at the third annual Financial Capability Innovation Awards presented by the nation's leading technology innovator, EverFi, Inc.
BankUnited was honored at the third annual Financial Capability Innovation Awards presented by the nation's leading technology innovator, EverFi, Inc. Presented at Nasdaq Marketsite in New York City, the award recognizes BankUnited's significant efforts to improve the financial capability of Americans through unique digital learning initiatives. "At BankUnited, we are proud of the role our executives play in bringing critical financial literacy education to students. By providing a solid foundation in personal finance at a young age, we are equipping them with the skills and knowledge that will prepare them for life as successful adults," said Joe Roberto, BankUnited president, New York region. "Each year, we travel to the birthplace of the American financial system to honor institutions that are truly dedicated to going above and beyond in service to their communities," said Ray Martinez, EverFi President of Financial Education . "The Financial Capability Innovation Awards have given us the opportunity to share and celebrate the tremendous investment these institutions are making and continue to make in the communities where they live, work, and serve. 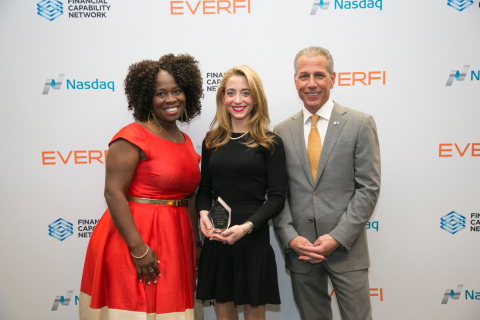 For EverFi, our time here reminds us just how critical the role innovation continues to play in empowering Americans to pursue economic opportunity and achieve financial security for themselves, their families, and their community." BankUnited is committed to providing students with the skills and knowledge needed to successfully navigate the increasingly complex financial world we live in. BankUnited has partnered with EverFi to bring the Financial Scholars Program to local students at no cost to schools or taxpayers and has reached over 6,974 students since 2011. The web-based program uses the latest in simulation and gaming technologies to bring complex financial concepts to life for today's digital generation. BankUnited, N.A., a national bank and wholly-owned subsidiary of BankUnited, Inc. (NYSE: BKU), is headquartered in Miami Lakes, Florida with 94 banking centers in 15 Florida counties and six banking centers in the New York metropolitan area at December 31, 2016. One of the largest independent depository institutions headquartered in Florida by assets, BankUnited provides a wide range of commercial and consumer banking services. For additional information, call (877) 779-2265 or visit www.BankUnited.com. BankUnited can be found on Facebook at facebook.com/BankUnited.official and on Twitter @BankUnited.